Rev. Dr. James MMuathime Mbuva is an ordained Minister of the Gospel of Jesus Christ who became an Associate Pastor of KICC in 2009, and with the retiring of the Senior Pastor and Bishop, Benson Andebe in 2015, he became the Pastor In-Change and Senior Pastor in 2017. Dr. Mbuva was born again into God’s Kingdom after hearing the good news of salvation from John 3 in 1972, and immediately God revealed to him that he had called him into the Ministry of Reconciliation and by 1976 he joined Scott Christian University in Kenya to train for the ministry. Dr. Mbuva served as a Pastor, and later Senior Pastor at AIC Kimutw’a. In 1985 he served as a Pastor in the inner-city church AIC Boman, and in 1987 he was appointed by the Regional Educational Board to start a new Bible college today known as Nzau Cameron Bible College in Makueni County. In 1989 Dr. Mbuva joined Fuller Theological Seminary to train for cross-cultural missions and Biola University where he got his Ph.D. in Intercultural Education. In America, Dr. Mbuva has served as Round Table and Agape Sunday School Teacher with Glendale Presbyterian Church at the city of Glendale. 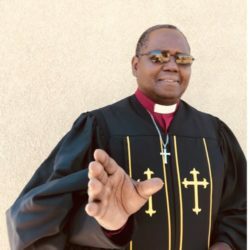 He served as an Assistant Pastor serving with Fair Haven Missionary Outreach Fellowship which ordained him in 1993 at Montebello. He joined KICC in 2003 where he served as the leader of men, secretary, vice chair of the council and then served KICC as an Associate Pastor, Pastor, and now he serves as the Senior Pastor. Rev. Dr. James MMuathime Mbuva has seen the hand of the Lord in all his ministry experiences both in Kenya-Africa and in the USA. In his ministry, leadership and shepherdship In The Foot Steps of the Chief Shepherd Jesus Christ, Dr. Mbuva has engaged in ministry where people get delivered from sin and death in Christ, healed, taught, counseled, reconciled, mentored, comforted, blessed, and married. It is now his desire to see KICC grow to her higher spiritual heights as it develops and matures in Kingdom worship life, Kingdom service life, Kingdom prayer life, Kingdom giving life, Kingdom caring life, Kingdom loving life, Kingdom witnessing life, Kingdom teaching life, Kingdom seeking life, Kingdom believing, Kingdom practicing, and Kingdom making disciples life. For it is about Jesus Christ, and the Kingdom of God He has instituted in peoples’ hearts. It is my earnest prayer that Jesus increases in my life, and I decrease. Regarding service to the greater community in California State and the global community, I am a professor, and I teach at National University where I prepare teachers for PK-12 Education Classroom. Welcome to KICC!